Is it safe to use Blue anil balls as part of a ritual bath? I have a friend who just got over kidney surgery, and she's in pain. I'm putting together a spell kit for her, and I happen to have some anil balls on hand. 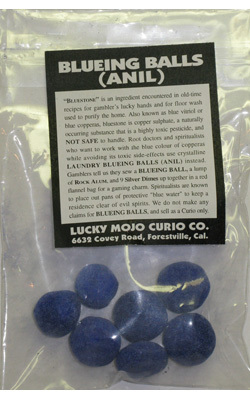 According to this http://www.luckymojo.com/bluestone.html blue anil balls are safe to use in baths. It's bluestone, copper sulfate, you definitely want to avoid since it's a pesticide and fungicide. fausto wrote: Is it safe to use Blue anil balls as part of a ritual bath? I have a friend who just got over kidney surgery, and she's in pain. I'm putting together a spell kit for her, and I happen to have some anil balls on hand. The blue anil balls are about as toxic as tempra paint, which is to say, not very. They're generally quite safe in a bath. I have a question that I'd like to offer to the LM community. I have handled powdered blueing for years, but just recently found some liquid blueing and thought I'd substitute it into my recipe. The first time I opened the bottle, I got a mighty shock. The same thing happened another time. Both times, I didn't even touch the liquid. Has anyone else ever experienced this or have any information about what type of power is contained in blueing? Thank you very much for your thoughts on this. Blueing is used for cleansing and unjinxing work. Most likely, because you built up a static electrical charge, not everything is a sign or omen. Yes 'blue balls' is another issue all together! Yeah she means bluing balls. Hehehehe. Yes I'm giggling like a 14 year old. Raymond Buckland's recent book, Buckland's Book of Gypsy Magic, has a very serious issue. On Page 51 he gives detailed, explicit instructions on how to use "bluestone" as a remedy for "red, inflamed eyes". The issue is that he's not talking about anil balls or blueing: he says specifically that the bluestone he's referring to is "a form of copper sulfate", which should be dissolved in water and used "as an ordinary eyewash". 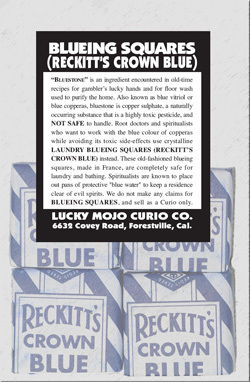 I have come upon a spiritual cleansing spell that calls for "Blue Squares" to be boiled in water. You then dissolve camphor in the blue water and add to that an equal part of Florida Water. Does anyone know what the blue squares are and whether they are carried for sale on this site? 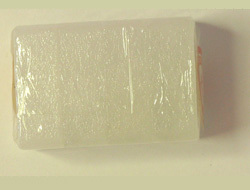 Does Lucky Mojo carry dissolvable camphor as well? Thanx for any guidance offered! divinedaughter -- Here you go! Your question was about a product, and thus the thread that you started has been merged into the ongoing thread about this product. 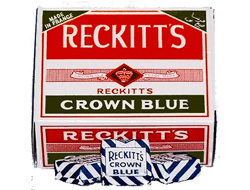 Does Reckitts Crown Blue have a shelf life ? I'm also thinking of adding sea salt to it.for my bath. Yes, Blueing is well known for purification and uncrossing. Adding Salt to your Cleansing Bath can be a great addition as well. Take your time, be sure to read through some of the resources found here on the forum as well as such pages as Hoodoo in Theory and Practice. Please which day of the week will be ok to start uncrossing and purification bath. Some people work by the days of the week, but if you need to do an uncrossing bath, just do it as soon as possible and don't worry what day of the week it is. Hello everyone! I was wondering if mixing crushed blueing with salt a traditional hoodoo protection recipe? Hi, i have moved your query to the thread on Blueing, as it is a specific, not a "general," Protection Spell question. The answer is yes, but both blueing and salt dissolve readily in water or cologne, so although the mixture may be sprinkled, it is also great to add to a bath or to Florida Water, to make a body splash. Thanks for replying so quickly and for the great advice. I apologize for my mistake. Thanks for clarifying the posting sections for me.